Name, age, hometown: Sarah Bunkley, 20 years old, Fort Myers, Fla. What corps are you in and what is your role this summer? Kiwanis Kavaliers, and I am the pit section leader. Give us your full drum corps/marching music background. I marched three years of battery in high school, and this is my fourth summer in the pit with Kiwanis. How did you decide to be a member of your corps? 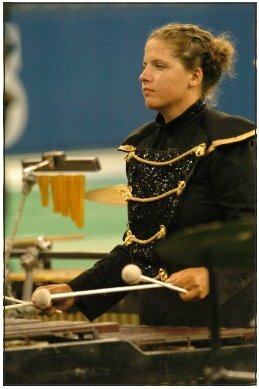 My drum captain in high school marched Tampa Bay Thunder in 2001 as a member of the snare line, so in 2002, a few of us from my school decided to audition. What first attracted you to the drum corps activity? I was a sophomore in high school, and I was riding to rehearsal in my friend's car, and he put on a CD of Santa Clara Vanguard's 1995 show. I was hooked. What advice would you give to young people who want to march? Go for it as soon as you feel comfortable. This activity yields values and experience you will never get by sitting at home, and you'll make friends that you'll keep for life. The last good book I read:"Scar Tissue," the Anthony Keidis autobiography. The last great film I saw: "Eternal Sunshine of the Spotless Mind" Jobs I have/have had: I am an assistant manager at Blockbuster in Clearwater, Fla. Three albums I'd want on a deserted island: A Perfect Circle, "Mer de Noms"; Dave Matthews, "Live with Tim Reynolds"; Brand New, "Deja Entendu" My favorite TV show: M*A*S*H. All the way. Favorite performers: John Leguizamo. <3 How do you "blow off steam?" Chew gum. What has been your formative drum corps moment? To me, it's the time spent at rehearsal. Best drum corps show ever: The Cavaliers, "The Planets" What are you most looking forward to about the summer? Meeting new friends, and seeing old ones. Worst thing about being in a drum corps: Someone's smelly socks in the overhead. During tour, the best part of the day is: SHOWTIME! Favorite drum corps personality and why: Tony DiCarlo. What I want to be when I "grow up": Happy Describe what you think a typical DCI show will look in 2015. Hopefully very similar to how they look now.